After returning from Penang, Malaysia with my visa earlier this month, I had the opportunity to visit a village with one of the students. As I mentioned previously, they go out each week to serve in the communities—they visit the sick, visit the prison, minister to sellers at the market, and more. 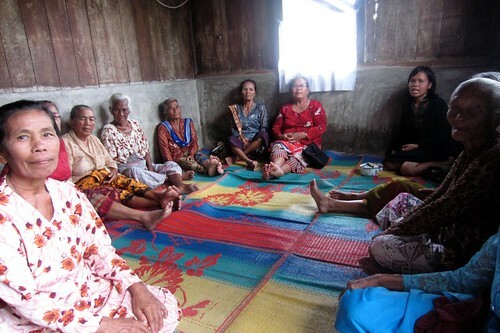 This visit, I accompanied Arlisna as she went to a village to lead a worship for elderly women. First we walked up the road calling to each home where one of the Oppung (grandparent) resides. When it was time for the worship, we gathered on the floor in one of the homes, sitting on top of mats laid out on the floor. This is common here in Indonesia. I greeted the Oppung-Oppung in the Batak language (“Horas”). The words and prhases of Bahasa Indonesia I have learned were of no use, as these elderly women only know Batak. For some of them, I was the first American they had met and who sat in their midst. I was welcomed and greeted with smiles and laughter; Arlisna, being our translator between English and Batak. About a dozen women were there. Most did not have hymnals, but could sing along from memory. There were hymns, Scripture, and a brief devotion. Through the time, I sat silently, yet with reverence and attention to the Spirit’s presence among us. An offering was taken, to be given to the local church. After the worship, we ate bread and drank tea. I prayed a prayer of blessing and thanks for them in English, my words, again being translated. I was invited back to worship with them again. If I have the opportunity, I would like to return and pray with them. It was a blessed time.